The stars don&apos;t lie, and two Case Western Reserve astronomers say research into the behavior of galaxies—those clusters of millions of stars, gas and dust—tell them there&apos;s a problem with theories about how the universe works. Stacy McGaugh, PhD, an astronomy professor at Case Western Reserve, and Marcel Pawlowski, PhD, a postdoctoral researcher in astronomy at the university, are part of a small group of researchers around the world who question whether the so-called "standard" model of cosmology works. In June, Pawlowski led a team of 14 co-authors from six countries that published a study rebutting studies supporting the standard model. That model arose as cosmologists puzzled over the universe during the last century. Calculations showed them there wasn&apos;t enough mass in it for gravity to pull dust and gas into galaxies. But what if there was more mass than the telescope could see—enough to give gravity something to work with? This unseen mass came to be called dark matter. The concept would have sounded wild if it did not so well explain nearly everything known about the universe and its evolution. But in the 1990s, McGaugh became mystified as he researched low surface brightness galaxies—smeary sort of star collections that, unlike pinwheel galaxies, are spread out with lots of space between the stars. The galaxies weren&apos;t behaving the way the standard model of dark matter and gravity said they should. In fact, their rotation seemed to be "a direct contradiction to Newton, and a direct contradiction to all the models that existed at the time, including my own," McGaugh said. "I drove myself crazy," he said. "I considered every possible angle and went back and forth. I went over this and over this, and every time I thought I solved it, I realized I hadn&apos;t."
Pawlowski ran into a similar problem with dwarf galaxies. The small dwarfs live in the neighborhood of our galaxy, the Milky Way, and the nearby galaxy, Andromeda. Dwarf galaxies also fail to behave according to the standard model. There are only a few dozen of these around the Milky Way—not the thousands the model predicts. And these satellite galaxies orbit their parent galaxy in huge thin discs, not in the predicted quasi-spherical tangle of comet-like swoops. "I think the standard model is kind of broken in this respect," Pawlowski said. "It doesn&apos;t predict these structures found in the Milky Way and Andromeda." In the paper published online in June in Monthly Notices of the Royal Astronomical Society, Pawlowski and his co-authors sought to rebut three papers that had attempted to explain away these contradictions to the standard model. In a follow-up study, he and McGaugh checked to see if standard model prediction would hold up for small galaxies orbiting the Milky Way if the presence of (relatively) nearby Andromeda was included in the model. "Long story short," McGaugh said, "it makes no difference. The standard model predicts the same thing in either case." Pawlowski and McGaugh published those conclusions in July in The Astrophysical Journal Letters. 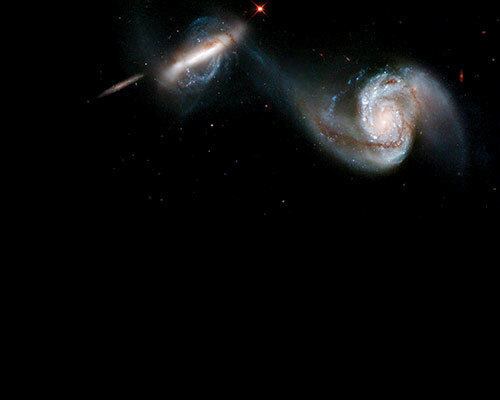 When galaxies interact, stars and gas are ripped out in long tails, as seen in these images. 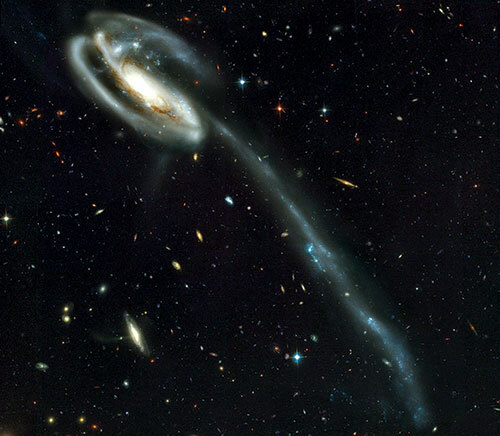 New dwarf galaxies are formed along such tails and share similar orbits. To learn more, visit bit.ly/PawlowskiStudy or bit.ly/Pawlowski_McGaugh.